Your bathtub faucet must meet many specific criteria, particularly if you are in the process of remodeling or upgrading an existing bathroom. Not only does your faucet need to be functional, sturdy, and reliable, but it also needs to be visually appealing in a way that complements the design of your new bathroom.Making that decision can be a tall order, and the process of choosing the Best Bathtub Faucets can be difficult and confusing given the wide variety of options available to both DIYers and home improvement contractors. For these reasons, we’ve assembled a helpful buyer’s guide with our reviews of the top recommended bathroom faucets currently available. Check out our reviews and guide below, and get the right faucet to put the finishing touch on your new or refinished bathtub. As one of the oldest manufacturers of bathroom fixtures in the world, American Standard provides their timeless classic look. Chances are if you grew up in the states, your bathtub had a spout nearly identical to the AS 8888.026.002.
home full size bathrooms. It fits a ½” water tube, and slips on for fast and easy installation. If you are replacing an old, corroded and mineral stained tub spout with a forever a classic, this is the tub spout you buy. Sometimes when you refinish your bathroom, you want a basic bathtub faucet that’s functional and durable if not necessarily the prettiest thing to look at while having a soak. For those renovators seeking something more aesthetically pleasing to look at during their time in the bath, Hiendure makes this gorgeous, black oil-rubbed bronze finish, wall-mount bathtub faucet with integrated hand shower. streams in the old farmhouse windows. The best part about this tub faucet though is it not only looks beautiful, it is built for longevity and durability. The entire fixture is constructed from solid brass, and the cross handle valves are ceramic to prevent dripping and leaks. It also uses a diverted to direct water to the hand shower with its 5-foot hose. This faucet makes a truly gorgeous addition to any Mediterranean themed or Old World style bathroom renovation. Looking to install a beautiful faucet for your deck mount tub? Peerless PTT29896-BN Apex is an ideal choice. The Roman style brushed nickel finish has semi-glossy sheen that gives your bathtub a simultaneously classic and modern look. This seamless blending of styles makes it look right at home in a wide variety of bathroom designs and themes, and both the fixtures and finish carries Peerless’ lifetime guarantee. As far as performance is concerned, this faucet is ideal for filling large tubs quickly thanks to its 18-GPM/68-liter per minute flow rate, and it is an ADA compliant fixture when properly installed. Best of all, it fits all 3-hole 8-16” pre-drilled tub decks without any need for modification. For deck mount faucet installations, Peerless is definitely the way to go. For bathroom designs that are intended to have an ultra modern look, Kingston Brass makes this chrome plated three handle combination shower and faucet kit to breathe new life into your bathroom renovation or new construction. Distinctly modern European in their look and design, these chrome faucets, handles, and shower head represent the best of modern French style. to resist rust and mineral stains as well as provide them with a lustrous shine. The shower-head is rated for up to 80 psi (plenty of good water pressure), and an energy/clean water efficient 2.0 GPM/7.6 LPM flow rate. Part of Kingston Brass’ Vilbosch line, this faucet and shower combination kit is the best possible choice for anyone looking to upgrade their existing shower and bath fixtures or who wants only the best in their new modern bathroom. The ultimate in elegance and cutting edge contemporary design, the FLG Deck Mount Widespread Waterfall bathtub faucet is a true work of art. The gently curving rectangular plate distributes your water in a natural waterfall-like stream as though pouring emptying a never ending pitcher into your tub. significant available deck space (making them less than ideal for Roman style tubs). Both the levers reflect the elegant design of the waterfall faucet itself, and are the perfect finishing touch to a bathroom constructed using contemporary European design. Be sure to check product documentation carefully for both your tub and this faucet, as there are certain model and design tubs for which this fixture is unsuitable due to its wide water distribution and unique lever design. All that aside, it is a truly gorgeous fixture fit to grace the most elegant of contemporary design bathroom constructions or renovations. Rapid flow design for filling larger deck mount tubs quickly. Easy to install in large deck mount style tubs. Does not fit Roman style tubs and deck mount tubs with limited faucet mount space. Do you need a freestanding, wall mount, deck mount, or combination faucet/shower fixture for the tub in your bathroom? This will help you narrow down what can be installed in your bathroom and complement your theme. Can be ordered in brushed or satin finish. It’s both durable and easy to clean, and nickel titanium finishes tarnish and scratch less easily. Comes in polished, brushed, or matte, and is durable, economical, and easy to clean. It is highly corrosion resistant, but it does tend to show water marks from minerals in your water. Excellent choice for neutral color palettes, comes in polished, brushed, or dark oil-rubbed finish with accented bronze highlights. One of the best metals for tarnish, scratching, and corrosion resistance. An all around good choice, can be polished to a high gloss, satin, or antique finish, and resists both damage and corrosion. Rather than combining with a standard overhead shower, many bathtub faucets can be purchased with a hand shower for washing your hair or rinsing off after a good soak. Prevents sudden bursts of hot or cold water when another water source in the house draws away hot or cold water. Keeps your shower water at a pre-programmed temperature for as long as your shower is running. Once you decide on features and finishes, you will be ready to pick the right bathtub faucet that suits your new or renovated bathroom. Who Needs a Good Bathtub Faucet and Why? Anyone who plans to renovate their bathroom or install a highly customized or luxury bathroom in a new construction needs to consider what type of faucet they want for their bathtub. Your lifestyle, budget, and family size are all the key determining factors as to what is the best fit for you. The right faucet can make all the difference between a longed-for escape at the end of a long day, or simply a way to get clean. What Makes a Bathroom Faucet the Best Choice for Your Bathtub? Among the myriad choices for homeowners and renovators, there are three types of bathtub faucet that you can install for your specific type of bathtub. 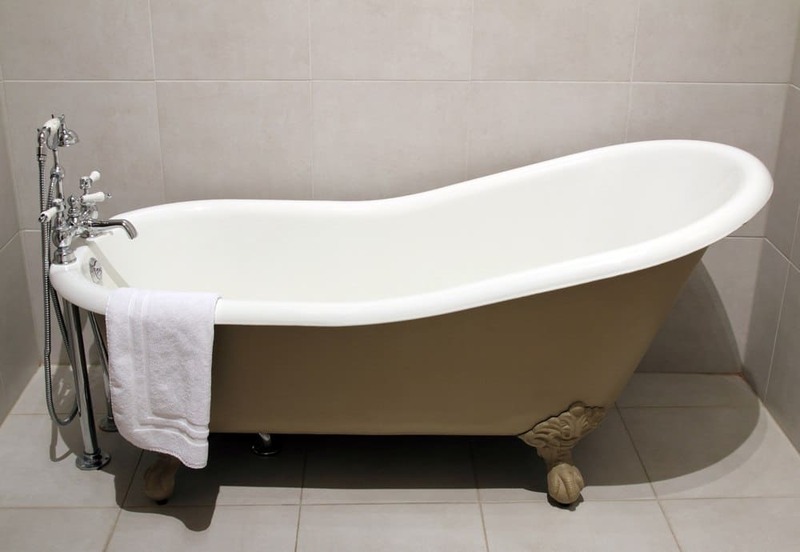 Not every design works with every tub, but knowing these three basic types will at least make the process easier. These faucets are designed for use with freestanding tubs that do not have pre-drilled holes for the faucet. The aesthetic effect of these tubs is significantly more striking, and they often act as the centerpiece of a new bathroom. Freestanding faucets are designed to come straight up out of the floor (thus their flashier veneers and finishes on their exposed pipes), and they are generally secured to the side of the tub or a nearby wall for support. The most common faucet type designed to be installed via pre-drilled holes in your bathroom wall, where it is typically suspended over the tub. This conceals the pipes while leaving the spout and handles remain exposed. Typically used on larger bathtubs and whirlpool baths, these faucets are installed via pre-drilled holes on the top rim of the tub (referred to as the deck), or installed into the tile surface surrounding the tub. Pipes remain concealed with the spout and handles exposed for convenient access. Your tub will already be compatible with one of these three options. What makes any choice the best? Let’s look at our product reviews to help you find the best fit. After reviewing the best products in each mounting style, you probably have a pretty good idea of what to look for in your new or upgraded bathtub faucet. It needs to be something that fits the type of tub you have installed, the finish needs to suit your design aesthetic, and the materials need to be highly durable for the best long term value. Any one of these five bathtub faucets would be ideal for your bathroom renovation or new construction. Choose the one that Best Bathtub Faucets fits your desired theme and budget, and make your bathroom that perfect retreat from the world.